If you love the soft beauty of Dalat and would travel alone, hope that this information below helps your trip is well arranged. + By Air: It takes 1:40 – 2 hours flying from Hanoi to Dalat. With Vietnam Airlines, there is one roundtrip flight per day and four times a week, at 1:30PM from Hanoi to Dalat and 11:00AM from Dalat to Hanoi on Tuesday, Thursday, Friday and Saturday. You can buy ticket by yourself online or through a travel agent, or possibly at the front desk of your hotel. + By Bus: It takes 22 – 24 hours driving from Hanoi to Dalat. You can buy the tickets at Giap Bat bus Termnal at No.6 Giai Phong Street in Hanoi or at Nuoc Ngam Bus Terminal with Tai Thang Bus Company. You also can refer the famous bus grand in Hanoi is Sinh Café, office at 66 Hang Than St. You can buy tickets at the station, travel agencies, or at your hotel. + By Train: It takes 27 hours from Hanoi Railway Station to Nha Trang Station and about 3.5 hours from Nha Trang to Dalat. For the buses from Nha Trang to Dalat, there is Phuong Trang Express or Mai Linh Express for your reference. – Carriage: Once coming to Dalat, you should take a carriage to tour around the city. You can take one at the T-cross near Thanh Thuy restaurant. Hotels in Dalat are priced from USD 15.00. Three or four star hotels are located near Xuan Huong Lake. If you want to enjoy a more private space, a villa outside the city is highly recommended. Most of big hotels in Dalat offer special promotional programs on Christmas. You are advisable to make a reservation as soon as possible in case all hotels are fully booked during the festive season. Specialities: Wine, hot soya milk, fresh fruits, vegetable, tea, flower and plan. – Than Tho Lake: from Dalat city center, travel to Thai Phien – Chi Lang Street. The lake is situated in the pine forest with serene surface. – Truc Lam Monastery: an extraordinary structure situated in Phung Huong mountain peak and surrounded by an immense pine forest with the turquoise Tuyen Lam lake in front. 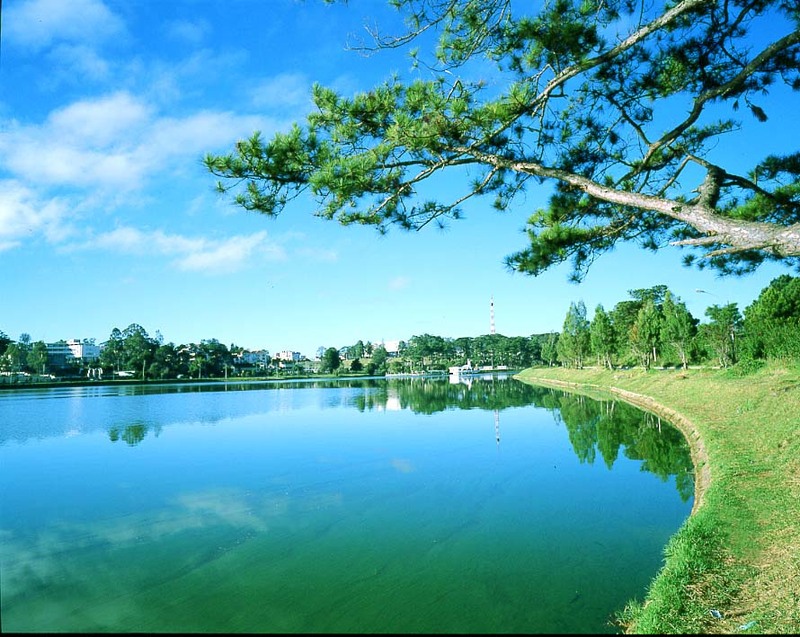 – Tuyen Lam Lake: the largest fresh lake in Dalat located near Phung Hoang Mountain, about 6km from Dalat. The lake has many small oases and turquoise water. – Langbian Mountain: or also known as Nui Ba Mountain is about 2,169m. It is a special destination for picnics, explorations of nature and local culture. From Langbian peak, you can look the panorama view of Dalat with villas, schools and churches with high bell tower. Dalat features cool dew in the day and cold dew at night. Visiting Dalat in the Christmas time, you will feel like walking in the picture.